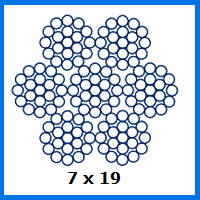 Delivering a delightful combination of resilience and malleability, our 7×19 stainless steel rope is produced in this 13mm diameter design to satisfy the needs of customers from various industries. Read on for more information on the 13mm 7×19 Stainless Steel Wire Rope. As you can see from the technical data, this stainless steel rope is rated to handle 9,791kg payloads. That gives you almost 10 tonnes of lifting power from a rope with a diameter of a little over a centimetre. Its flexibility means that many buyers choose this wire rope to use as part of a sling. It is also capable of keeping corrosion at bay in marine environments, hence its suitability in the context of rigging. Anyone who is looking for rope that has an attractive exterior that should not rust might want to consider this particular product. There are many other configurations of stainless steel rope available, including 1×19 and 18×7, so you are not restricted to just one type when you shop with Rope Services Direct. We can tailor our wire rope to the needs of our customers, putting together standalone assemblies or supplying the fittings needed to turn a blank length of 13mm 7×19 rope into something which is ready to fulfil a specific role. Phone us on 01384 78004 or drop our experts an email to learn about the products and services we can provide. Getting in touch is also the best way to nab a quote and ask any question before you decide what to order. 13mm 7x19 Stainless Steel Wire Rope Overall rating: 5 out of 5 based on 6 reviews.